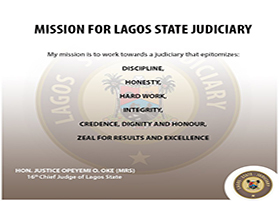 Welcome to Lagos State Judiciary web site. We are committed to ensuring disputes are resolved fairly, timely, transparently and economically by leveraging enabling technology with inherent seamless integration of the court processes, structures and administration. We provide automated case processing, payments and communication through this online court system to make it easy for various parties to a case to have timely access to pertinent case-related information. The Lagos High Court System is comprised of The Criminal Division, The Land Division, The Probate and Family Division, The Commercial Division and The General Civil Division. 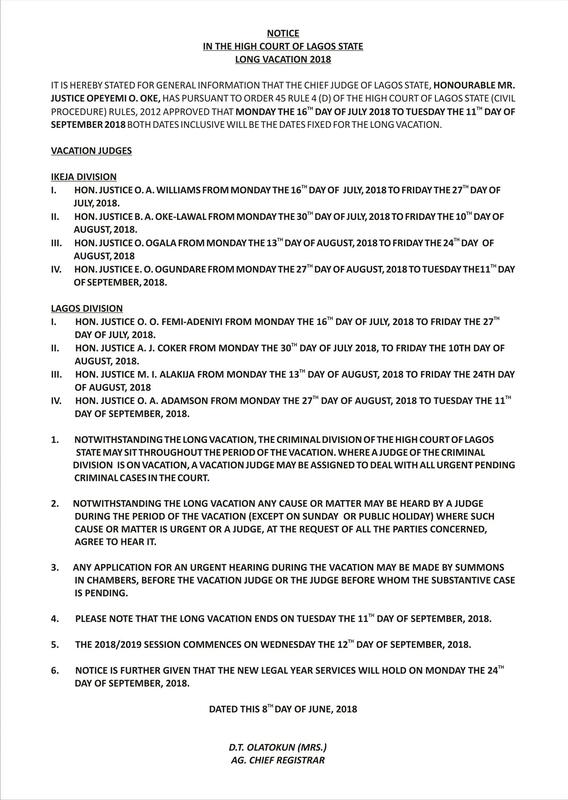 The rules and procedures governing the operations of the Lagos State Hight Court is of;High Court of Lagos State (Civil Procedure) Rules 2019. The Lagos State Judiciary has a rich heritage. We the staff of Lagos State Judiciary are committed to Lagos State and the Community. Our mission is to provide quality and professional service in a knowledgeable manner. We take pride in our work and hold ourselves accountable to the highest standard of performance. E-Filing: E-filing is a feature in Lagos State High Court Judiciary Information System (JIS). Valedictory Session: Bench, Bar Eulogises Late Chief Judge, Justice Christopher Segun. Lagos Chief Judge Inaugurates New Executive of Magistrates Association. Lagos State Judiciary Rebrand Probate Registry..
Lagos Judiciary Trains Magistrates on Application of Restorative Justice. Lagos CJ Makes Case for Plea Bargaining. Lagos CJ Hinges National Development on Investment in Younger Ones. Lagos CJ Urges Individuals, Corporate Bodies to Partner with Judiciary on Bondsmen Scheme. Justice Oke Warns Magistrates against External Interferences . Lagos CJ Launches New Court Rules 2019. LET THE FEAR OF GOD BE YOUR WATCHWORD IN THE DISPENSATION OF DUTY - LAGOS CHIEF JUDGE . Lagos Judiciary Gets New 35 Magistrates. Lagos Judiciary Sheriffs Trained on New Civil Procedure Rules. Lagos Judiciary Sheriffs Trained on New Civil Procedure Rules . Lagos CJ, Reels Out Achievements, Admonishes Judiciary Staff to Look Ahead with High Expectations. 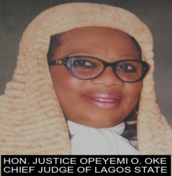 LAGOS CJ INAUGURATES 47 NEW SHERIFFS TO QUICKEN TRIALS, JUSTICE..
LAGOS CJ FREES 7 INMATES FROM IKOYI PRISON, PROMISES TO COMMENCE RESTORATIVE JUSTICE CENTRES JANUARY..
LAGOS CHIEF JUDGE DIRECTS MAGISTRATES IN THE STATE TO DEPLOY MORE OF NON-CUSTODIAL SENTENCING FOR MINOR OFFENDERS IN ORDER TO DECONGEST THE PRISON..
CJ PROBES N8.4 M FRAUD IN THE HIGH COURT OF LAGOS STATE. Lagos High Court Judges, Magistrates Inducted as Scout Members. Delay in Justice Administration: Hard Time Awaits Lawyers Next Year. 23,900 Cases Disposed Between 2017-2018 - Lagos CJ. Lagos Reiterates Commitment to Professionalism, Public Confidence in Magistracy . Lagos CJ Seeks Stakeholders Support on Effective Justice Delivery. Lagos Chief Judge Commissions Staff Canteen and Allocates Plots of Land to Judiciary Staff. Legal Practitioners Absorbs as Court Registrar. Lagos Chief Judge Advocates Adherence to Code of Conduct. Lagos CJ Unveils Commitment Statements in Five Magistrate Courts. Lagos State Scout Council Inducts Justice Oke as President. CJ Decries Backlogs of Court Cases in Lagos Courts . Ambode, Chief Judge Pledge Continuous Support for Judiciary Reforms… As Lagos Judiciary Holds Maiden Bi-Annual Lecture. Sustain the Vibrancy of Lagos Judiciary –Judiciary Workers Told. 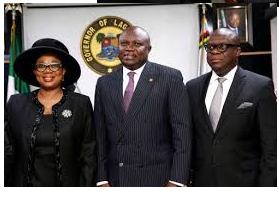 Lagos Judiciary Gets Three New Judges. Presidential Committee Releases 66 from Lagos Prisons. 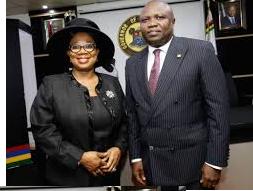 Lagos CJ Inaugurates Small Claims Court for Efficient Justice Delivery of Small Claims. Lagos Courts Get New Sentencing Guidelines to Forestall Prison Congestion. Lagos CJ Commissioned Solar Energy Power for Court Efficiency, Effective Justice Delivery. Lagos Judiciary Set To Review Sentencing Guideline for Convicts. Lagos CJ Frees Tuberculosis Infected Prison Inmate. Ambode, Osinbajo, CJN, Others Commend Lagos Judiciary on Establishment of Sexual Offences Court. Lagos CJ Set up 15 Man Committee to Review the High Court of Lagos State Civil Procedure Rules 2012. Lagos State Judiciary staff swears Oath. Lagos CJ Unveil Commitment Statements. Chief Judge Urges Staff to Embrace Commitment Statement for Quality Service Delivery. Lagos Chief Judge Grants Freedom to Four Prison Inmates..
Restorative Justice Will Complement Our Criminal Justice - Chief Judge of Lagos State. Alternative Dispute Resolution: Lagos Is on Track Says Chief Judge. Lagos CJ Inaugurates LG Election Appeal Tribunal. Lagos Judiciary Needs More Judges for Quick Dispensation Of Justice -- Ex NBA President Says. Two Lagos Judicial Officers, NYSC Member Nabbed for Corruption. Unnecessary Adjournment Could Cost You Your Practicing License, Acting CJ Warn Lawyers..
Ambode Swears-In Oke As 16th Substantive CJ …As CJ Vows to Stamp Out Corruption, Uphold Rule of Law. Copyright 2011 Office of The Chief Judge, Lagos State Judiciary, All rights reserved. Powered by First Hightower InfoTech Ltd.